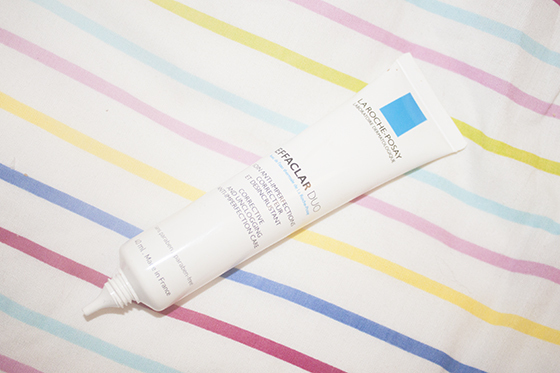 I mentioned in my recent November favourites video that I'd been loving the La Roche Posay Effalacur Duo. Effaclar Duo is basically a spot treatment that aims to reduce the apperance of inperfections and purify the pores. It's a complete skincare solution that leaves the skin looking clear, smoother and really aids a lot of the skincare woes I personally have. I've never really used a product like this before, It's made such an overwhelming difference to my skin over the past few weeks, to the point where it's currently the only skincare item I'm using at the moment. I suffer from hormonal and dairy breakouts which tend to get sore and cystic and really bring me down. However this has cleared them up a treat and since adding it to my routine my new breakouts have been kept to an absolute minimum. I'm so impressed with this product I really cant put into words how much I love it. I've noted that the overall appearance of my skin looks completely different, my pores look smaller and my black heads much less noticeable. It hasn't dried my skin out either like some spot treatments, my skin feels more balanced if anything! I know theres a lot of blogger hype for this at the moment but it's such a wonderful product and has worked wonders for me personally. Im normally uncomfortable about recommending skincare but this is possibly my all time skincare hero!